Elevation is a key concept in level design, and this no less true for Halo. Elevation can help make your map more interesting visually, interactively, and tactically. Forging Walkways and Spaces can only go so far. A flat map is going to suffer from boredom. Maps that contain variations in elevation through out are simply more interesting to look at and move about on. Adding variations of elevation through out your map can give players more interesting perspectives of your map. Being able to stand on high ground and see over obstacles can offer a feeling of empowerment that players tend to want and need. It helps them explore and learn your map in different ways other than just walking around. Now compare that with a map that is predominantly flat. Can you see yourself having to run around the map to see all the parts of it because you cannot see over terrain or structures? Being able to change your elevation can offer perspectives of your map that are simply more interesting. It isn’t just how the map looks, but how players feel when they traverse the map. Moving up or down gentle ramps simply feels more interesting, and having some Paths move down under and hide below other Paths and Spaces can increase the curiosity of players to explore your map. You probably would not be able to think of a map where players preferred to move exclusively about the ground level. This is because players just find ramps more interesting than flat ground and will choose a Path over a ramp more often than to remain on flat ground. Terrain makes some of the best ramps, partly because they look more natural – more like they belong there. But they also offer subtle movements up and down that are more natural because the movements are not steady – terrain is never straight at any angle. Consider the sand bar on Forge World. It gently slopes up in a natural curve to a flat surface. The slope is not a stead angle like a ramp block – not in any direction. And it is this natural, uneven, rough slope that a significant segment of the population would prefer to play on. Clearly the player above has additional advantages while the player below loses some of what he already had. The general rule is that elevated positions offer additional protection, reduce effectiveness of cover below, make explosive ordnance easier to use, and offer more movement options to the player above. On the other hand you can wind up with a high position that is so exposed that holding it becomes a risk. While stepping back may shield a player from fire below, other means of cover may be necessary to cut off other sight lines. Angled Walkways, or ramps, are useful to changing a players elevation in small ways that result in using the ramp itself as cover by backing down the ramp. For mid and long range fire fights, this is a powerful use of a ramp between two levels at different elevations, even if one is just a little lower than the other. This concept is perhaps one of the most basic in FPS, and you need to embrace it through out your map. Angled Walkways that are open on one side can increase your map’s skill gap by making strafing left and right also up and down. This makes strafing more challenging, increasing the skill gap on your map. Wrap Around is a term for a Path that moves up and around on itself so that when you reach the other end of the Path you find yourself at the power position looking down at the start of the same Path. This type of feature can add interesting Game Play to many maps, as the struggle for the high ground begins with being exposed at the start of the Path itself, under fire by the one holding the power position above. Orthogonal Paths – one Path crossing over the other – offer protection for the lower Path directly below the higher Path to the degree that the player above is unwilling to abandon his position of power. Orthogonal Paths tend to make maps interesting so long as there are not so many of them crossing each other that the map becomes a maze, creating confusion for even the more skilled. And allowing players to jump down from the high Path to the low Path simply gives players along the high Path more options. Having a cascading series of elevated platforms allows you to limit the view of the ground position from the top position by hiding portions of the ground in the blind spot of the intermediate elevations. The player on the top elevation is then forced to abandon his position at the very top to that of the intermediate position if he is to get a better angle on his adversary below. Again, this incentive helps make your map more interesting, because it forces players to abandon one advantage for another. If an elevated platform stretches across your map with nearly unobstructed sight lines, then the platform should probably be segmented. 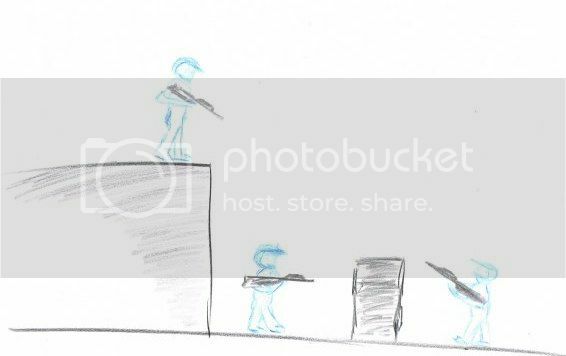 Subtle changes to the platforms’ elevation through the use of small ramps could help; or even a small pass through structure that breaks the sight lines. Take that thought further, when two elevated platforms of equal height face each other, they can feel like the same platform with a hole in the middle. That is, it can feel like one large flat area. Others might recommend you place them at unequal heights to maintain some verticality in engagements, but I believe it depends on what you are trying to do with the opposing ledges. At least you are aware of the primary issue that opposing ledges presents. Trick jumps are fun for some players who have skill and want to utilize their skill to create an advantage for themselves. But they should never be the primary means of getting anywhere on a map. They should only be short cuts that skill can leverage, increasing the skill gap of your map. Never make the principle Path require jumping; rather use ramps and staircases. Trick jumps should be intuitive only as the short cut. It can be confusing to see the principle Path appear to go over a crate or some block that requires jumping. Someone may look at it and think, Is that the direction I should go? When all along it is just a short cut, but the principle Path is not obvious at all. Forging elevation into your map makes your map more interesting to look at and interact with. Elevation adds dynamics to Game Play by adding vertical elements to engagements. Elevated positions generally offer players advantages, and tend to yield power positions on your map. Elevation can add additional dimensions of Game Play to the players and offer more options of design to you the forger. Ensure you do not create confusion through misuse of trick jumps as a means of creating Paths upwards to higher elevation.